video production / multimedia storytelling / we are immune. on California Ave. in Oak Ridge, TN. I pull through Stubb Stewart State Park’s Dairy Creek West campground and I see no one. I see what looks to be a parking lot for recreational vehicles. Cyclone. Avalanche. Raptor. Hornet. Voltage. Hurricane. Outlaw. Outback. Razorback. Komfort. Mountain Aire. Chateau. Bullet. Cougar. Arctic Fox. Road Warrior. Thor. Aerolite. Denali. Fun Finder. Thor has a three-legged stand out front, holding a large DirectTv® satellite. The tripod is pinned to the ground with yellow hi-vis twine tied to orange plastic stakes. Why is Mountain Aire’s “aire” spelled with an “e,” I wonder? And why is Aerolite missing the “g” and the “h” that are normally present in “light”? Does “lite” feel “lighter” without them? Yes, I realize—it actually does. But then, is a liteweight trailer better than a heavy one? I consider cyclones and hurricanes and avalanches and raptors and outlaws. I’d be inclined towards something heavy, I think. By the same logic, Komfort should be more comfortable when spelled with a K. I recall being told by someone that the c-to-k swap is a tradition born out of self-identifying with the Ku Klux Klan, though that was when I lived down South and regularly passed barber shops with names like Kathy’s Kustom Kuts. I’m not watching the road, so I almost mow down a bleary-eyed guy in casual camouflage making his way back from the state’s bathroom facility. I raise two fingers off the steering wheel in apology and the guy nods. I’m here to see the camp host. It’s 9:12 a.m., and I see his trailer now sitting in site #55. It’s a sleepy-looking Jayco Jay Feather with a little sign out front that says “Camp Host Dan Foreman.” No signs of life, and I’m afraid to knock. Always have been. Even when I’m camping and the host is my host, I’ve never felt comfortable approaching their little cave. But then, when I’m out in the woods I’ve never been all that eager to spend $8 on a handful of firewood. I’ve always had dreams of escaping into the wild. Of going off the grid. I had a doomed affair a couple years ago with a 39-foot Spartan Spartanette travel trailer that was built in 1953. Word is that after World War II they had to find something to do with all the aluminum and rivets that airplane manufacturers had left over. The answer: Travel America in an aluminum shell. The Spartan had a bunch of interior water damage when I bought it. A tree branch had fallen on it in the prior owner’s backyard, and it had sat there soaking for a few years. I spent months gutting the thing down to the shell and fixing the hole. And then it sat there. And then it sat there some more, until my girlfriend dumped me and told me to get the thing out of her backyard. The writer’s grandparents, Don and Viola Cline, camping in Tennessee’s Smoky Mountains. If I think about it, I don’t think my dreams for the Spartan could have existed without the Airstream that sat behind my grandfather’s house in Oak Ridge, Tennessee. By day he was a nuclear chemist who worked on the Manhattan Project, but apparently after work he went from supper straight down to the basement. He made his own wine, bullets for his guns and flies for his fly-fishing. He did all his own maintenance on his Oldsmobile, had a photography darkroom in a closet, a big garden in the backyard, and stockpiles of stuff he’d canned. Family vacations were mostly about him dragging everyone around so he could dig for fossils or photograph plants and insects. 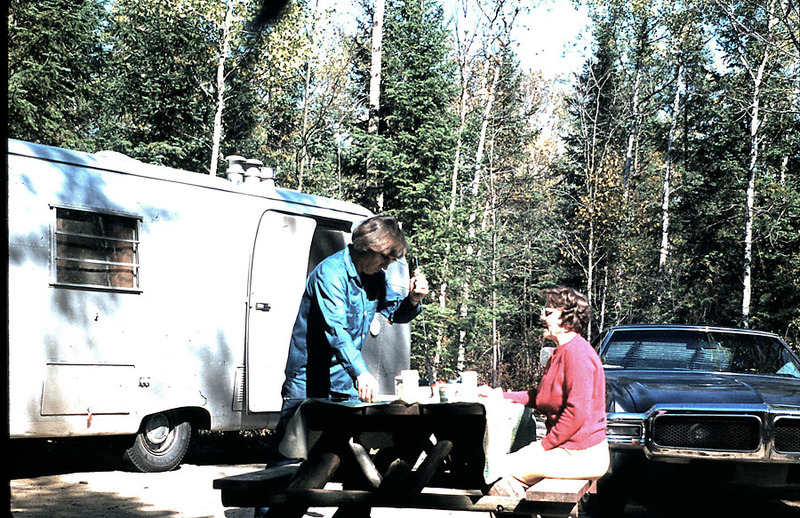 Weekends were about the family relaxing around the trailer while he hunted and fished the Smoky Mountains. 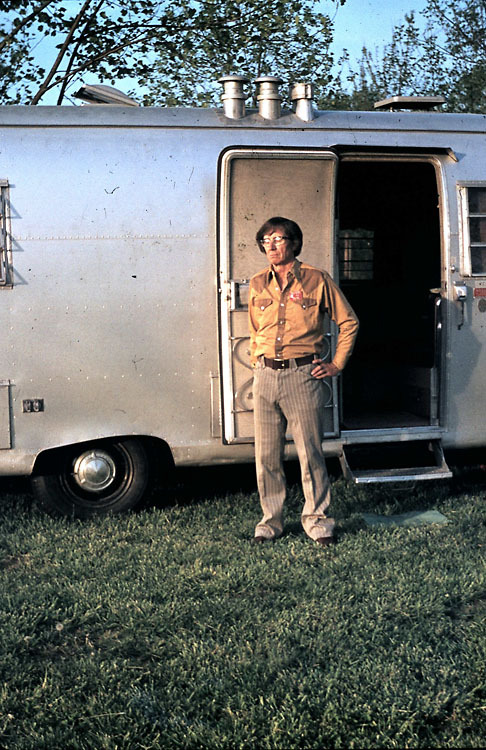 The Airstream was a vehicle for his interests, or at least for storing his family while he pursued his interests. I can still remember what it smelled like in Oak Ridge, in the woods behind his house on California Avenue, and in that trailer as a ten year old. He gave it up when I was eleven, and moved in with us in Louisiana so he didn’t have to die of cancer alone. I wonder if the time I spent by my granddad’s bedside made me admire him, or whether witnessing my mom’s devotion made me want in on the action. The comparisons of me to him started in my teens, and I drank them down. They continued well into the years of my darkroom, my hunting, my fly-fishing, and my trailer—that hopefully now sits, fully restored, on Vashon Island under the care of the older couple that took over the project when I admitted a rare defeat. Upon his death, I was given my Grandpa’s fly rod and tackle boxes, his tools and tool boxes, and a primitive stone axe he’d unearthed in Mexico. Apparently Grandpa told my mom to get rid of his gun collection rather than to pass them to me. “The time for guns is over,” he said. I bide my time futzing around the campground, to give Camp Host Dan Foreman time to get moving. Whoever vacated site #9 left a little collection of pinecones and dead sticks and stuff on the table in a messy little arrangement that sits as a little natural history witness to their having at some point made an excursion from the confines of #9’s gravel pad. Some smoke drifts lazily out of the fire pit at site #14. Sites 11 and 12 are reserved for the handicapped, and are on either side of the restroom the camouflage guy had come out of. Does he not like going to the bathroom in his trailer, I wonder? I most certainly wouldn’t. I can think of a lot of reasons, too—all of them having to do with (what is for me) the fine line between trailer and porta-potty. There’s still no movement around the grounds, so I hike up to the Frisbee-golf course to check that out. I wind up hiking for quite awhile. I wonder if I’m still procrastinating. Another similarity to my grandfather: Social anxiety. As I walk the trail, I try to figure out what I’m doing here. I think maybe I’m here doing research for my retirement, which, barring something unforeseen will come around 28 years from now. I’m picturing what it would be like to travel the country fly-fishing and hosting a campground—teaching kids how to build campfires and telling ghost stories and having youngsters offer me a hot dog. Maybe I’m here to find out if I could possibly stand an RV. I’ve been witness to their popularity while tent-camping my way across the country, but have never really understood. My Spartan was going to be cleanly finished as 300 square feet of office space, and maybe eventually a place to crash while building my real cabin in the woods. It wasn’t going to have a kitchen sink or be carrying a sewer tank. I wasn’t going to be banging my elbows trying to take showers, or be trying to make dinner in a kitchen three feet from the pitiful toilet. I wasn’t going to buy a gigantic truck to tow the thing, or go miles out of my way looking for someplace to turn around. I certainly wasn’t going to go park it in a wooded lot, hook an extension cord and sewer hose to it, turn on the TV, and call it camping. I wonder if that changes as you get older. When I finally get back to Dairy Creek West, I see that I missed all the action—Only Thor and the host trailers remain. I spy an old guy raking the gravel pad in the site across from the bathroom, so I give myself a pep talk and head his way. Camp Host Dan Foreman agrees to talk to me while he rakes, but I can tell he doesn’t want to. This is exactly why I procrastinated, I think. “How long you been doing this?” I ask. “Goin’ on five years,” he says. “Do you ever see any wildlife?” I ask. I ask Dan why he volunteers as a host. These are not the answers I had in mind. But I keep rattling of the questions that, hours earlier, seemed like they might be good ones. I ask Dan about the work that he does. It strikes me that though ostensibly all Oregon State Parks camp hosts are volunteers, Dan is not a volunteer. Dan is an old man who is getting paid in free parking. He is earning the $26 dollars per day it costs to park in a “Full Hookups” RV site with a gravel pad and a picnic table. In exchange for parking, he rakes. And gives disappointing answers to questions he’s asked. Dan puts his rake in a trash can that’s bungee-corded to the back of a little green golf cart. It’s surprisingly loud when he turns the key—gas, not electric. He drives the cart a few feet to the next site, turns it off, gets out, and picks up the rake again. I walk over and take a seat on top of the picnic table and just watch him rake awhile. 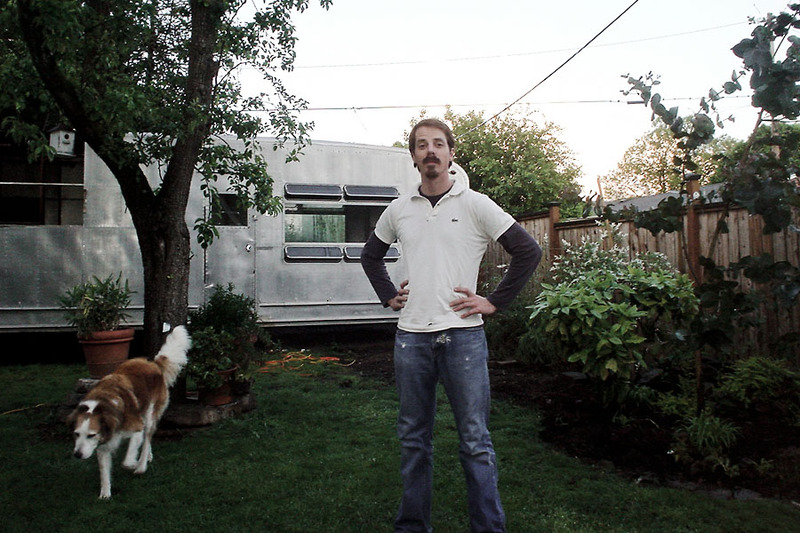 The writer with his 1953 Spartanette, in backyard on North Shaver Street in Portland, OR. I wonder what my Grandpa would think of all this—of RV’s, of Oregon, of Frisbee golf, of me, of Dan. I wonder if he would have liked to have spent his retirement the way I’m fantasizing, if my Grandma hadn’t gotten cancer, and then he hadn’t, too. Would he have spent his time “relaxing?” Would he have spent it fishing and eating young people’s hot dogs? Would he think these new fiberglass trailers are as gross as I do? Would he think their names are as strangely obscene as I do? “Damn,” I realize—Is Spartan any less silly of a name than Thor? And then: “Damn.” Grandpa’s Oldsmobile was a 1968 Toronado. That’s an even more ridiculous name than Cyclone. I watch Dan rake. The smoke is still barely rising from the fire pit at site 14. “You ever hear of those Japanese Zen gardens where they rake the rocks?” I ask. “Oh, I dunno,” Dan says. I allow a long pause, looking at his eyes and hoping he’ll add to his answer. There’s a moment when I realize I’ve let the pause go too long, and now it’s awkward. Dan breaks it. “I’m not the Zen master,” he says.